When I was 16 years old I really wanted to go on the school ski trip. That meant getting a part-time job. I worked in the local diner at a bowling alley. My friend worked at McDonalds. She made it sound really good. She took part in their training programme and I distinctly remember us testing her on the type of onions in a cheeseburger. (Dehydrated onions if you are interested.) She always talked about what a good team she worked with and it sounded a lovely place to work. 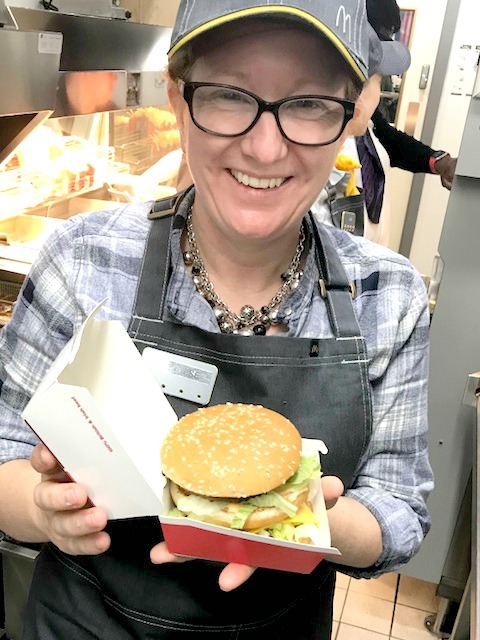 Fast forward 25 years and my dream of working in McDonalds came true last week. Well maybe the term working is an over exaggeration. I did, with a bit of help, make my own Big Mac. I think my smile says it all. 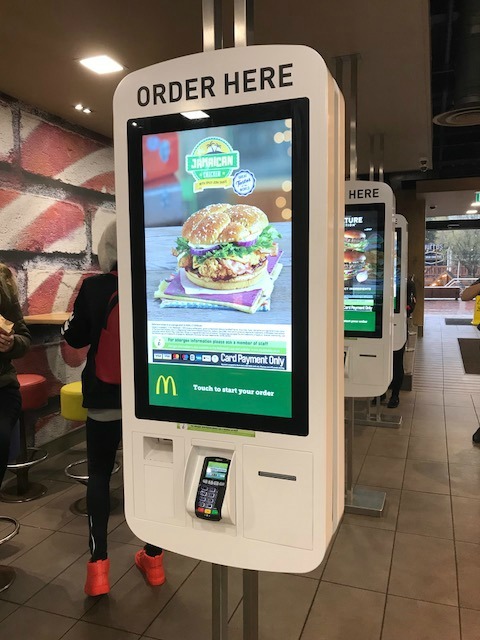 I had been invited to my local branch to see the changes that McDonalds are rolling out. You may have already come across the self service ordering points. I have to admit that I had assumed they were to cut staff costs, but it is all there to make the customer experience better. Lets face it, as a Mum I have been known to be standing at the counter with 3 shopping bags trying to find out what drink big man wants whilst he has run off to get some ketchup and little man has wandered out of my sight. The idea is that with the new ordering system you can take your time and choose what you want and how you want it. You even have the option of choosing an area to sit and they will bring your food to you. I wont lie, I was extremely dubious of this the first time we did this in the rather packed Skegness restaurant this summer, but it worked. It was so easy and meant the children and my parents were able to sit down whilst I ordered. There is even an app you can get your order ready on and scan as you walk in store too! If you are like me, you will order a burger and then pick out the gherkins. I mean there is no point in saying no gherkins as it will take twice as long for your food, right? The way they prepare the burgers has changed, meaning you can order the burger the way you want it and it will take the same time as normal. Clever! 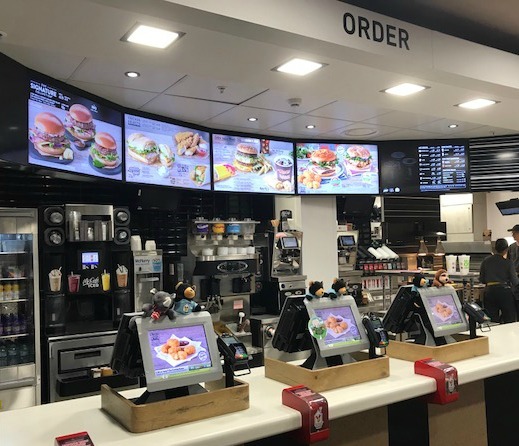 Talking of clever, the menu boards are now screens that change and show you the many options McDonalds have to offer. Behind the scenes in the kitchen, everything was like a well oiled machine. I had expected it to be loud and manic. It was organised, friendly and everyone worked as a team. There are ipads to keep you (or the children) entertained and I had to ask what the black circles in the middle of the table did. A squeal of delight came out of my mouth when the manager told me they were phone chargers. As if I need any more convincing to pop to McDonalds to grab a quarter pounder with cheese when I'm on a shopping trip. I was also really impressed with how McDonalds get involved with community projects. They even litter pick around the restaurant 3 times a day. I think that is really good, if annoying that they actually need to do this. I had a lovely afternoon, seeing the changes that were being made. 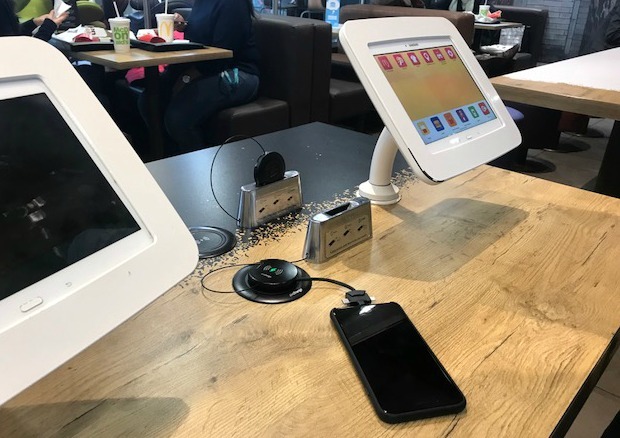 Keeping McDonalds up to date and always striving to make the experience better for the customer. Have you been to one of the new style restaurants yet? What did you like best? And probably the most important question of all, should I stick to my favourite quarter pounder and cheese meal or try a signature burger the next time I visit? It was really insightful. 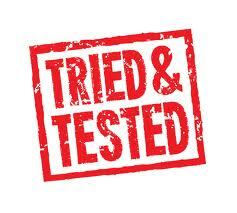 I had just jumped to the conclusion it was all cost cutting but it is all there to make things easier. Maybe I need to embrace change more! I hated it the first time I used it - I don't like change! But I am getting there. Yes that was key really. Oooo I wouldn't mind a cheeseburger! My husband is always good at making the boys have a fruit pack as well as fries.